SHAWNEE—The Oklahoma Baptist University (OBU) women’s soccer team took a preseason trip to California, where they served the local community and assisted with cleanup from the wildfires in the area. The Lady Bison headed west with the intention of performing service projects while also training for the upcoming season. Due to the poor air quality from the wildfires that have ravaged the state this summer, training times were rescheduled and an exhibition match with Chico State was canceled. However, this did nothing to dampen the spirits of the team. “Although the air quality was at dangerous levels at various times during our trip, it seemed that anytime we sought to train or serve, the air quality improved. 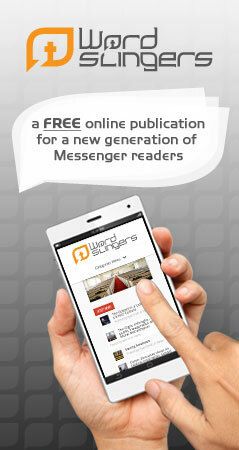 God had the team securely in His hand, and His presence was comforting the entire time,” OBU Head Coach Mike White said. 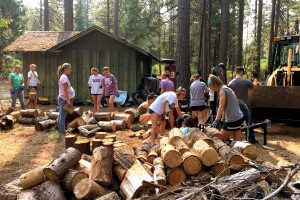 OBU players and coaches volunteered with four separate groups on four different days, serving those impacted by the Carr Fire that has burned more than 220,000 acres and destroyed more than 1,000 residences in Shasta County and Trinity County. The Lady Bison began their week of service by helping split and stack wood for a single mother with two children and an elderly couple, ensuring that both families had enough firewood to last throughout the winter. “It was definitely rewarding to know that these families would be taken care of through the winter because of just the couple hours that we spent doing that,” senior defender Jennifer Goethe said. Evacuations in the route of the fires and poor air quality caused many of the schools in the area to fall behind in preparation for the upcoming school year. Players split into small groups to help with several individual classrooms at a local elementary school. The Lady Bison assisted with any task necessary to prepare classrooms for the upcoming semester, from stapling packets of paper to painting a playground. 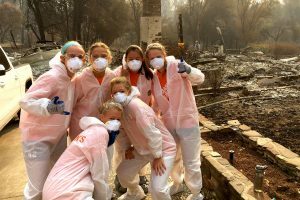 Members of the OBU women’s soccer team wore protective gear while serving in some of the hardest hit areas of the Carr fire. They helped sift through debris and ash to locate valuables. The church that hosted the team during their stay was also coordinating with Samaritan’s Purse to assist in the cleanup of areas that had been hardest hit by the wildfires. Interacting with the Samaritan’s Purse volunteers inspired the Lady Bison to take a day to help out with cleanup from the Carr Fire. Working alongside the homeowners, the team helped sift through the remains of homes lost near Redding, Calif., to help locate any valuables that could be salvaged. Volunteers were required to wear protective gear while working, including hazmat suits, dust masks and eye protection. OBU players also served dinner at the local rescue mission and interacted with the families going through difficult circumstances at the mission. Speaking with individuals from all walks of life had a profound impact on the team. The Lady Bison used the trip to develop deeper bonds as a team while making a positive impact on a community. According to CAL FIRE, the Carr Fire is 93 percent contained as of Aug. 23, exactly one month since the start of the blaze. Casady Fletcher is the Assistant Director of Athletics Communications at Oklahoma Baptist University in Shawnee, OK.
View more articles by Casady Fletcher.